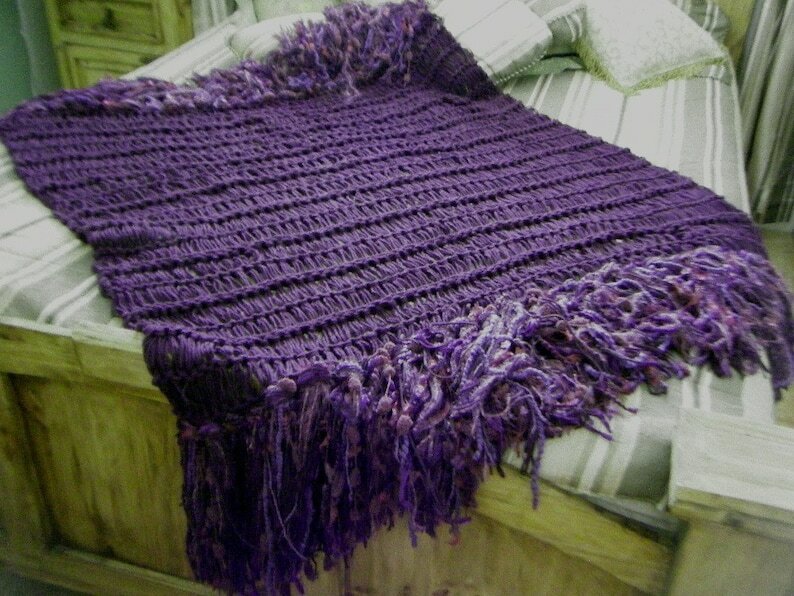 This deep, dark, solid purple, hand knit, home interiors design decor, fringed throw afghan blanket is the perfect accessory for bedroom, porch and beyond! I've named it "Regal" because its plum, eggplant, grape, violet and more are such rich, royal, luxurious hues. The soft, thick fringe makes it a unique focal point. I use 3 strands of strong, durable, dark purple yarn for the base. Then I add foot long, thick, beautiful fringe on each end, as shown in these images (there are many shades of purple in the fringe, including some somewhat lighter purples). The supplemental photos show some other color ideas that I have created at customers’ special request over the years. SIZE: This richly textured throw blanket is warm without being suffocating and is the perfect, snuggle size to enfold and nurture an individual or a couple (6 feet long including fringe x 3 feet wide to start; it's very elastic because of the special stitch I used, so it easily stretches wider). As with most of my work, please just let me know if you'd like yours a little different; custom orders & special requests are welcome and I generally can make a design shorter or longer, use different colors, etc. Totally amazing!!!!!! Work of art. Love the addition of the Morrocan style fringe to the rest of the fringe. So soft. Love it!!!!! this seller goes the extra mile to assure the customers' thoughts. She even sent samples of yarn for color choice. WOW! Trust this shop!!!!!!! Well, well, well, just when I thought it was safe to say that Celeste had already made me the most gorgeous blankets in existence, she goes ahead and surpasses herself exquisitely, once again. 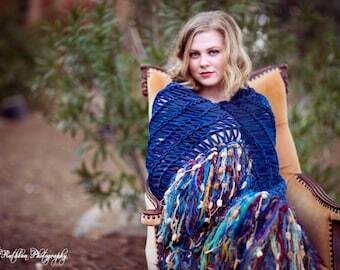 This blanket is nothing short of spectacular. It truly is a masterpiece-just gorgeous! The colors, the colors, the colors-so rich and magnificent. The fringe is outrageously fabulous, everything about it is perfection. I absolutely love, love, love it! Celeste worked with me to create this custom blanket in rich shades of purple, which compliment my decor perfectly. This is the purple blanket I have dreamed of, but even better than I could have ever imagined, because Celeste spun her magic once again. Thank you so much, Celeste, I am speechless over this beautiful blanket... except to maybe ask you if it's too soon to create another one?